Ubuntu is a Linux distribution for your desktop or server, with a fast and easy install, regular releases, a tight selection of excellent packages installed by default, every other package you can imagine available with a few clicks, and professional technical support from Canonical Limited and hundreds of other companies around the world. 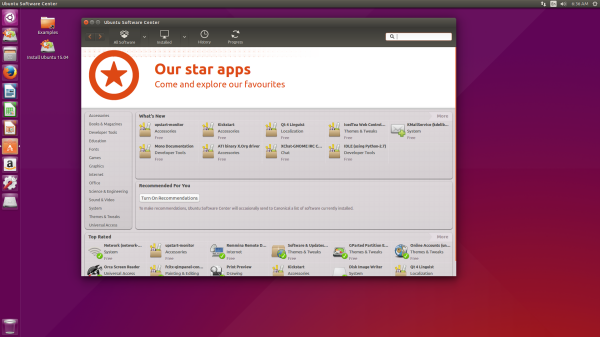 Ubuntu raises the bar on the Linux desktop experience. It includes the latest, stable version of many core products, and in that spirit is the first distribution to bring Mozilla Firefox 3 to millions of users. The combination of Linux and Firefox make Ubuntu a superb web desktop, with fast browsing and greatly reduced exposure to viruses, web forgery and spyware. The LTS versions provide Long Term Support. The Desktop version is a Live Disc with hard drive installation option. The Server version is an server install disc with options for DNS server, OpenSSH server, LAMP (Linux/Apache/MySQL/PHP-Perl-Python) server, SAMBA file server, etc., etc. Kubuntu uses KDE as the Window Manager / front end instead of GNOME. Ubuntu Studio is based on Ubuntu and provides a full range of multimedia content creation applications for these workflows: audio, graphics, video, photography and publishing.